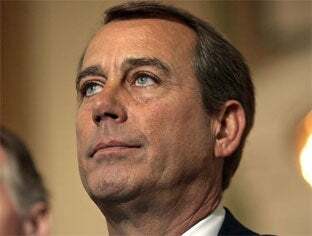 GOP Congressional Leader John Boehner finally responded to Obama's "tan" joke. Last week at a White House Correspondents' Association Dinner President Obama joked that he and Boehner had a lot in common—they were both people of color. President Obama was poking fun at Boehner's permanent tan. Good thing Boehner's a good sport. He recently acknowledged Obama's heckle and said he rather be heckled than ignored. I just love that Obama is feeling free enough to crack jokes at "White People". The "why do white folks tan" mantra has been long-standing in some parts of the black community. You know, as my grandmothers sometimes commented: if Whites folks have such a hard time with black folks why are they always trying to get their skin tanned? I'm looking for the day when President Obama asks someone, Hey, what's up with the curly perm?